Mandy Harvey is a deaf, American singer-songwriter. Recently featured on America’s Got Talent, she reached the semi-finals with Simon Cowell’s press of the golden buzzer, eventually placing fourth overall. After losing her hearing at the age of eighteen Mandy pursued several career options. Mandy eventually decided to fight through the challenge of her hearing loss and decided to try singing again, returning to music in 2008. She quickly became a regular performer at Jay’s Bistro in Fort Collins and then at the Dazzle Jazz Lounge in Denver, one of the Top 100 Jazz Venues in the world. Following her tremendous performances on America’s Got Talent, her music has begun to attract the attention of people all over the world. CNN’s Great Big Story featuring Mandy has had over 9 million hits on social media and she is now part of Burt’s Bees Remarkable Women campaign. September saw the release of her first book, Sensing the Rhythm. Mandy is also an Ambassador for No Barriers USA, traveling the country heightening awareness, breaking down barriers, and challenging stereotypes as she leads the charge toward a brighter future for all. 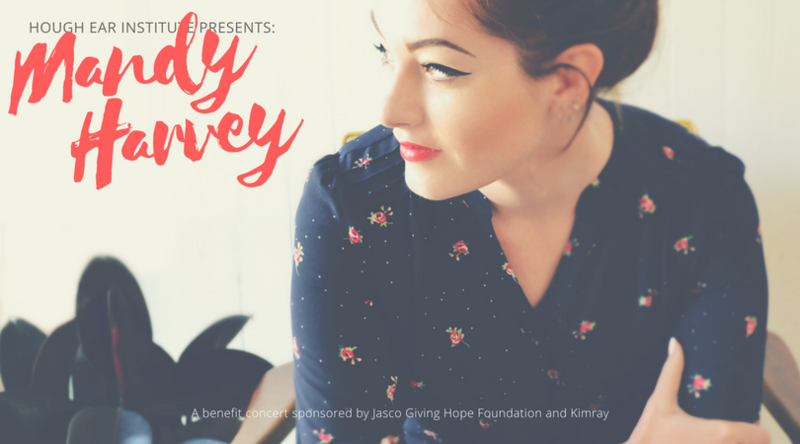 Hough Ear Institute, in partnership with the Jasco Giving Hope Foundation and Kimray, is proud to present Mandy Harvey in concert Wednesday, December 20th at 7:00 p.m. at Oklahoma City’s historic Tower Theatre. Tickets on sale Friday, October 13 at 10:00 a.m.
Tickets are now available online by following this link. For more information about the concert, or to learn more about becoming a sponsor contact us at info@houghear.org.